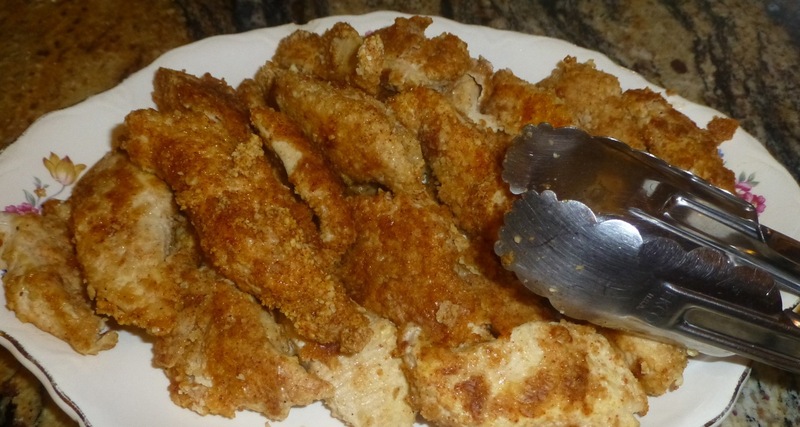 This paleo Chicken Fingers recipe is so easy to make and, although it says kids would love it, it’s a great meal for all ages. So — let’s begin. Besides the pound of chicken breasts (or tenders if you prefer) here’s what you’ll need. 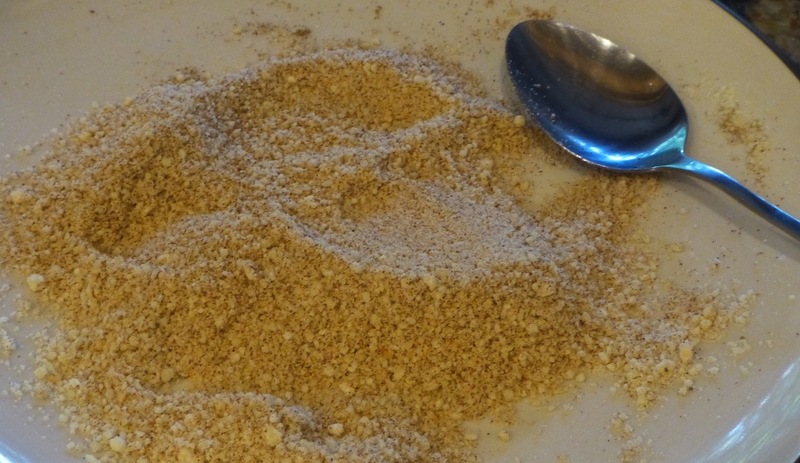 First you’ll be combining the dry ingredients to make the breading. Then you’ll be making a “dipping” station. Having your lined cookie sheet next to your dipping station will make it easy to transfer the chicken pieces onto it. This is what they will look like. Because of the clumps some of my pieces weren’t breaded enough but taste-wise they were fine. I served this dish with fried ripe plantains. Have you ever had them? 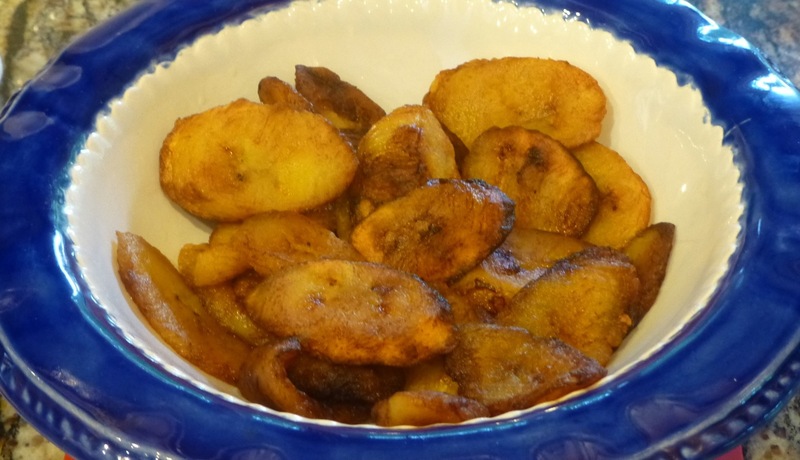 If you decide to try them, you want to make sure you get very very ripe plantains. Yes, yellow ones are good but the ones that are turning almost black are even riper and sweeter. (But don’t use the green ones for this.) Just inspect them for white fuzziness — mold. You don’t want to get sick. An interesting side note – most grocery stores I’ve been to will get rid of or discount the really really ripe plantains as they think no one will buy them — unless that is you go to a Spanish market who know the clientele who buy these often. The plantains are sliced at an angle, mashed down a little with the palm of your hand and fried in coconut or olive oil. I chose to use coconut this time. 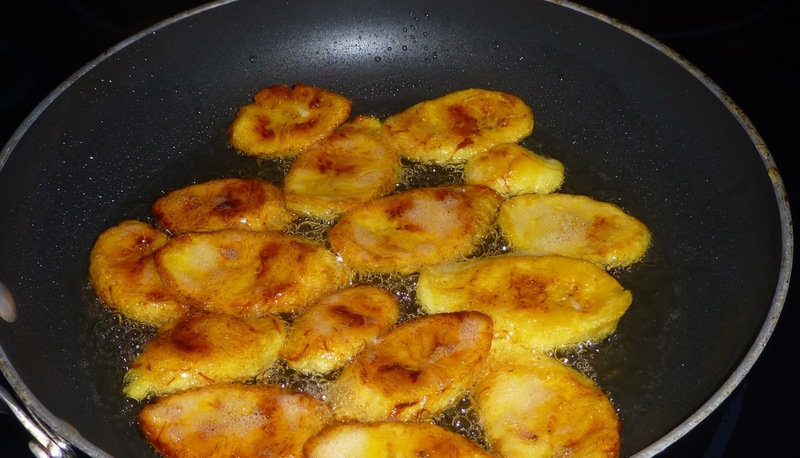 They don’t take long to fry and I can usually tell by the color of the plantain when they’re ready. If your heat is too high though they’ll cook on the outside but not on the inside. Turn your stovetop heat to almost medium, check for a nice golden color then turn it to the other side. And this is what you’ll get. You’ll notice some of them look a little “flat.” With the second batch that I was frying, I got distracted but quickly turned the stovetop off so they wouldn’t burn. Unfortunately they sat in the oil longer than they should have so they absorbed more of the oil than usual. Not a “bad” thing but the fried plantains should have a little “puffiness” to them and shouldn’t taste like oil. Remember, this is about the plantain. So — pay attention! Now back to the chicken fingers. Ready to try the recipe? While the oven is heating, line a large baking sheet with parchment paper. 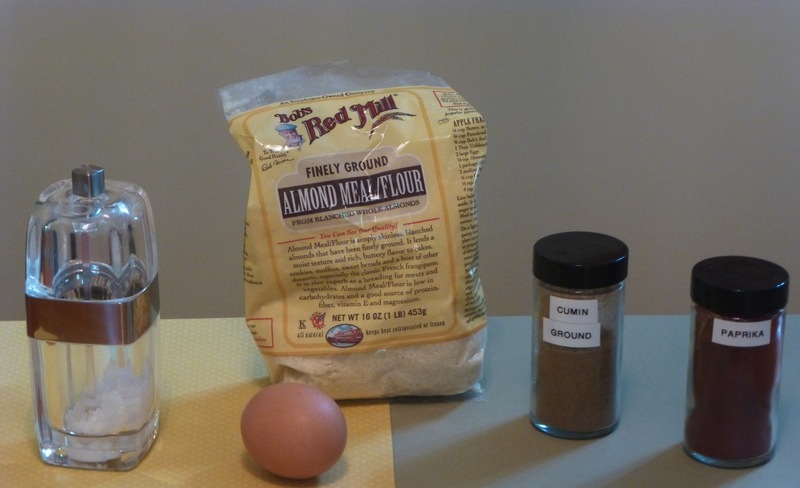 Combine the almond meal with the spices on a plate or shallow dish. If you especially like the taste of coriander or cumin, double it to 1/2 a teaspoon for more flavor. Put the beaten egg in a shallow dish all by its lonesome. You’ll be dipping your chicken in here so make sure the chicken will fit in the dish. If your chicken is wet or soggy, dry it with a paper towel. 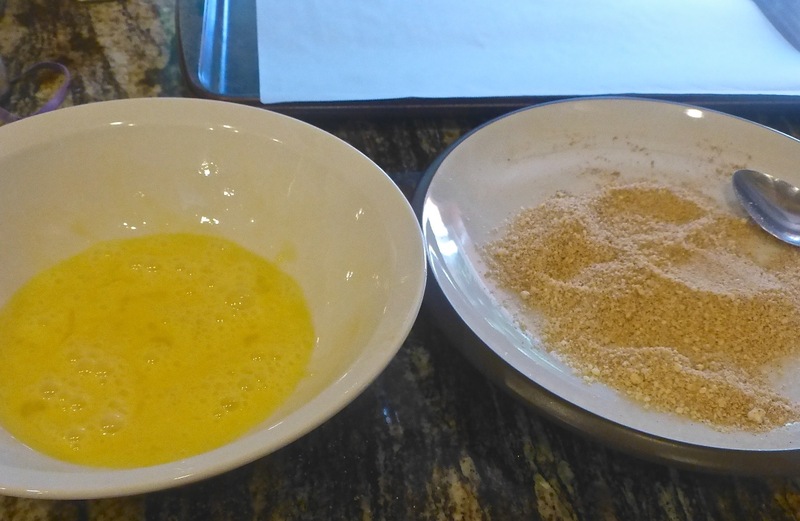 Dip the chicken in the egg mixture then in the almond meal mixture. Gently put your dipped chicken pieces onto the lined baking sheet. Bake the chicken for approximately 16-18 minutes turning once in the middle of baking. Making sure that your chicken pieces are about the same thickness will insure that they will all be cooked at the same time. And — that’s it! Simple, no? 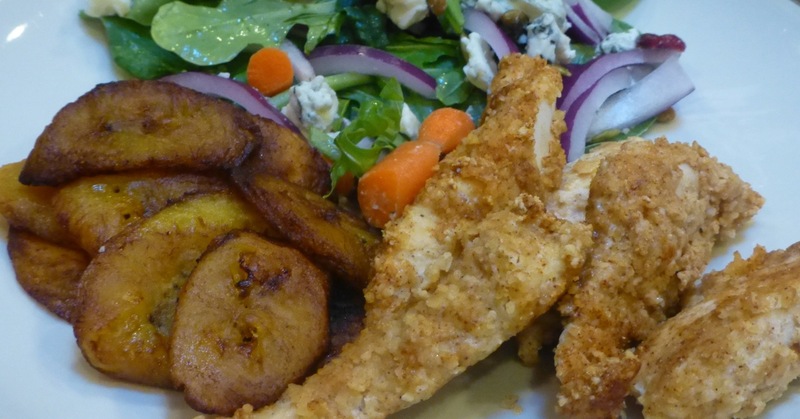 I served my chicken fingers with fried plantains and a side salad. Enjoy! Note: It has been said that paprika has anti-inflammatory and antioxidant properties. Check it out!